There are, occasionally, titles that seem to herald a new day in videogames. Some have claimed Quantic Dream's latest creation as one such experience, marking the future of interactive fiction.We hope you brought your umbrella, because this week Scott and I venture into Heavy Rain to discuss whether or not this theory holds water. As usual, we will avoid spoilers until absolutely necessary. For the spoiler-sensitive out there, we give plenty of warning before we reveal secrets, so feel free to give this podcast a listen. 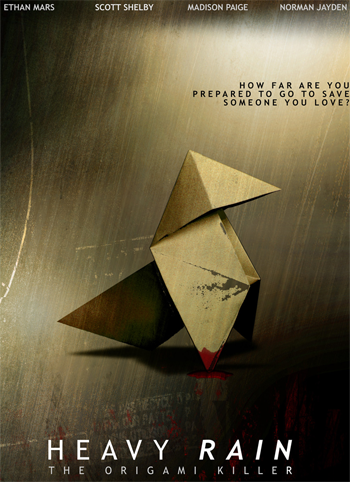 Whether or not you have played the Heavy Rain yourself, we encourage you to leave your thoughts in the comments section below. I generally agree with you. My closing thoughts on Heavy Rain would be that it is a very flawed but also very important game. It is a must-play for people eager to discuss the future of this genre. I'm in complete agreement. No matter how you feel about the game, it's important to take notice when someone takes risks. I'm excited to see what David Cage does next.